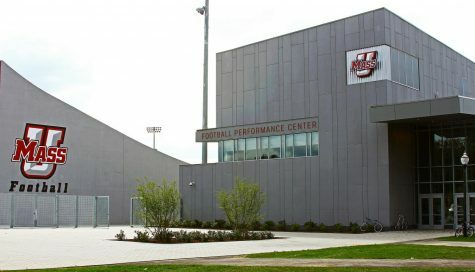 There wasn’t much scoring going around in the Massachusetts football team’s annual spring game Friday night, but the matchup under the lights of McGuirk Stadium presented a heightened competitive atmosphere for the Minutemen and their bevy of expected new contributors. 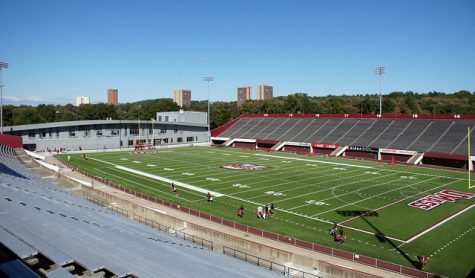 Team White prevailed over Team Maroon in a low-scoring affair 6-3, as two field goals from Logan Laurent upstaged Mike Caggiano’s lone field goal as the only three scoring plays in 44 minutes of action. 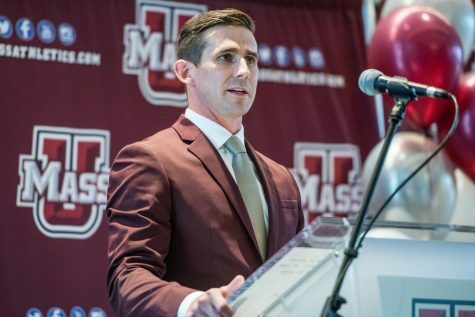 According to UMass coach Mark Whipple, Friday’s game was a building block for the Minutemen heading into the summer, as they enter the 2016 season losing its starting quarterback Blake Frohnapfel and top wide receiver, Tajae Sharpe, among other departures. “(The season) is a long way off. 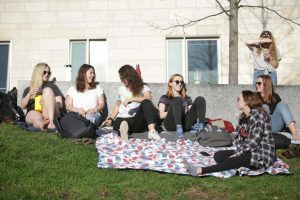 We are just trying to build depth, the next phase will have a lot of kids that we signed, recruit-wise, are here and get those guys and finish up academically is the biggest focus,” Whipple said. In a defensive showdown, redshirt freshman cornerback Brandon Mangram stood out with four tackles, an interception and a pass deflection for the day while playing for Team Maroon. 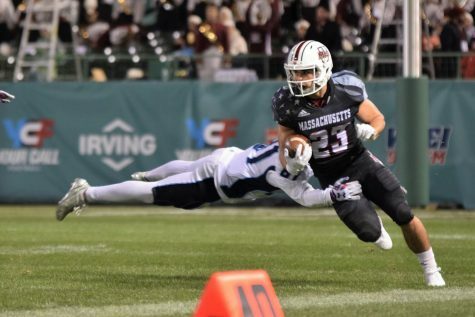 Both his interception and pass deflection came in the end zone, preventing the James Sosinski-led Team White from breaking through with a touchdown. Mangram also added a big hit on Jonathan Derolus down the sideline to cap his active night. “I told (Jonathan Derolus) before the game actually, don’t run outside the tackles because all spring practice he ran outside the tackles. But I guess he didn’t listen,” Mangram said of one his big plays on the evening. 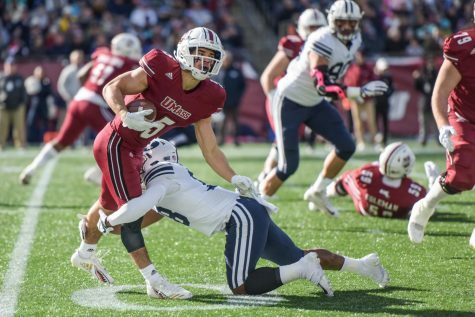 Mangram will be part of a defensive back unit also including James Oliphant, Jordin Hamilton and Jackson Porter that will try to fill the shoes left in the secondary by 2016 graduating seniors Randall Jette, Trey Dudley-Giles and Kelton Brackett. 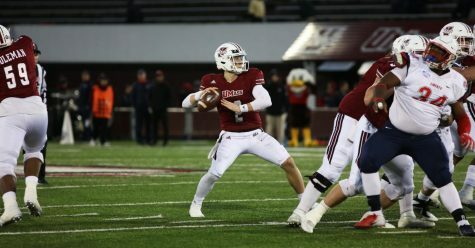 Heading into the summer, it appears UMass’ quarterback competition will revolve around redshirt sophomore Ross Comis and JUCO transfer Andrew Ford, who is set to arrive in Amherst for this coming fall. Starting for Team Maroon on Friday, Comis finished 8-of-15 for 58 yards. But it was Randall West, switching between Team White and Team Maroon as the third quarterback option, that had the best spring game performance. West was 7-of-11 for 90 yards, including a 38-yard pass down the left sideline to wide receiver Jalen Williams in the second quarter for either side’s longest gain of the game. 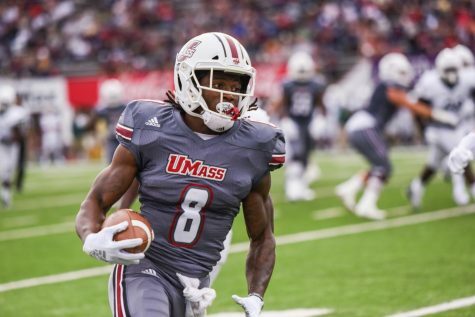 UMass couldn’t escape Friday’s exhibition without injury, as junior safety Zeke Edmonds had to be helped off the field in the first half after sustaining an injury making a tackle on John Robinson-Woodgett in the backfield. Edmonds was assisted to the sideline by members of the training staff while appearing to favor his right shoulder. He did not return to the game. 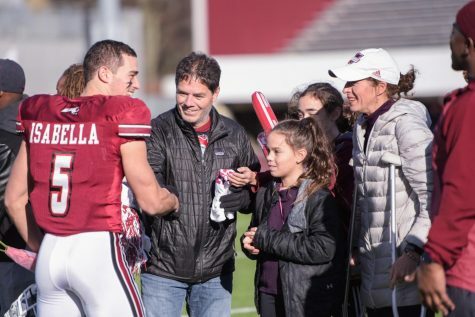 Redshirt junior linebacker Steve Casali was also a late scratch after originally being listed on Team Maroon’s roster. Former UMass safety (2002-06) and current NFL free agent James Ihedigbo served as honorary coach for Team White Friday and expressed excitement in being back at McGuirk and having the chance to interact with the Minutemen’s younger players. “Just imparting a little knowledge on all of these guys and having fun coaching. 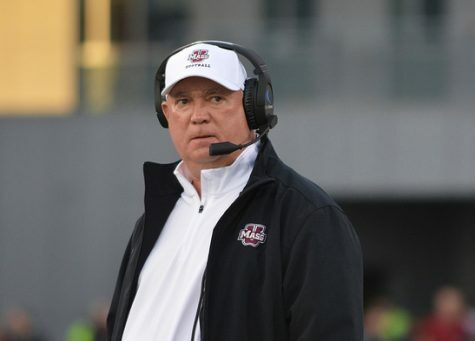 I got my first win as a head coach… Put me up there with (Vince) Lombardi,” Ihedigbo joked. Ihedigbo pointed at Sha-Ki Holines (two tackles, one sack), Da’Sean Downey (two tackles, 1.5 sacks) and Mangram as players that particularly stood out to him from the sidelines. “(Holines) is a phenomenal athlete and he was getting to the backfield. (Downey) can play flat-out. And as he matures, he’ll continue to carry more weight, but he’s a flat-out pass rusher,” Ihedigbo said. Ihedigbo, 32, last played for the Detroit Lions this past year and said he will wait until after the NFL Draft concludes on April 30 to sign with a team. What game were you watching? Mike Caggiano had the 2 field goals. He was wearing the white uniform with his name on the back..